On March 4th-6th I participated with Creative Memories in the Sweet Suite Weekend Retreat. I get to invite my customers as well as participate myself and we just scrapbook ALL weekend! 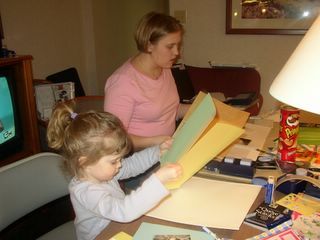 We stay in the Embassy Suites here in KC and set up shop in the living room area - then we all sleep elsewhere and get up the next morning and scrapbook some more! Kate came and helped us a little - mainly because her mommy missed her and Charlie. But it was funny to see Kate trying to scrapbook with us. I was insanely productive though - I got the first of my three New Zealand albums done!